CRL-U.S. Aluminum has developed new patent pending Corner-Loc® Corner Construction technology that serves as the strongest commercial door corner assembly in the industry. This has provided C.R. 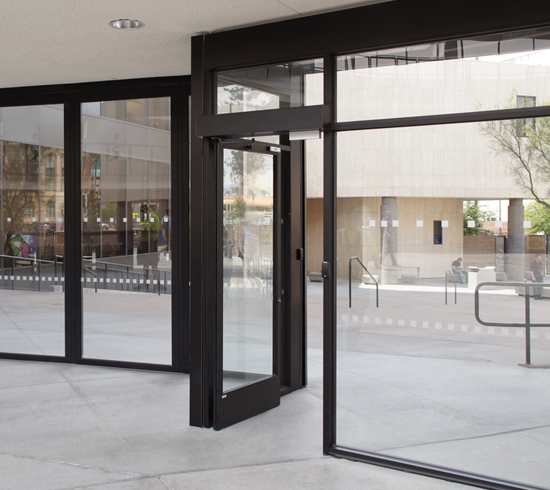 Laurence Company with the confidence to provide a limited lifetime warranty on the corner construction of all standard and thermal U.S. Aluminum Entrance Doors, giving absolute peace of mind to specifiers, installers, and end-users alike. Key components of standard door rail-to-stile corner construction have been carefully reengineered to minimize the damaging effects of forceful impacts and the repetitive torquing action of automatic door operators. CRL’s R&D team performed specialized severe torsion cycle testing in their advanced ISO 9001:2008 certified facilities to measure the reliability of the door corner construction against similar systems from other manufacturers. The results showed that the new Corner-Loc® technology significantly reduced weld failures and enabled the door to last many times longer than the closest competitor’s doors. The end product is a door designed for lifetime performance, which in turn translates into tangible value for stakeholders across the board. New Corner-Loc® technology comes standard on all CRL-U.S. Aluminum narrow, medium, and wide stile doors in thermal and non-thermal configurations. Visit crl-arch.com.